Recently my family, friends and I had a magical week staying at the newly renovated rooms at Disney’s Pop Century resort. 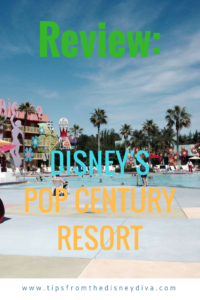 Every time we stay at Pop Century we find another reason why it is one of our favorite value resorts on property and this trip was no different! The newly renovated rooms are reason enough to keep coming back! We initially had a hard time deciding where to stay. This trip we had 4 adults and my almost 2-year-old traveling with us as well. We wanted to stay at a Value Resort because that would allow us a longer stay because of the cheaper price. We knew that we would have a crib/pack n play with us in the room so that made the decision a little tricky. 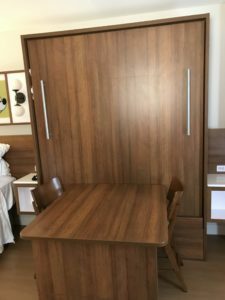 The rooms at Value Resorts are tight and adding that extra furniture in to the mix would make it harder. 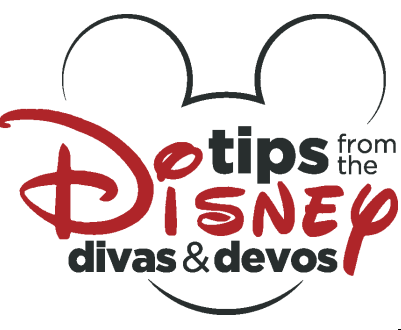 Canadian Diva recommends Pop Century for preschools, you can read her review here. Great theming inside the rooms! The appeal of the refurbished rooms was that we could tell from pictures and talking to other people who had been recently that there were at least two places that we could fit the pack n play with the new set up of the rooms. We also liked the versatility of the second bed folding up for the seating area was another plus. When we got our room assignment we were in the 80’s building (building 9) on the second floor. We were initially a little disappointed in our location because we had done a room request fax and wanted the 70’s section on the ground floor. Once we got to the room, however, we were fine with it. We were near the end of the Rubik’s Cube building closest to the bus stop and main building, so we decided not to see if we could be moved. The rooms were as nice as they looked in the pictures. Everything was brand new, including the hard wood floors! It was so much nicer than the old carpet that had been in the rooms before. The tv stand area was newly updated and the whole room had been equipped with plenty of outlets along with USB ports as well. 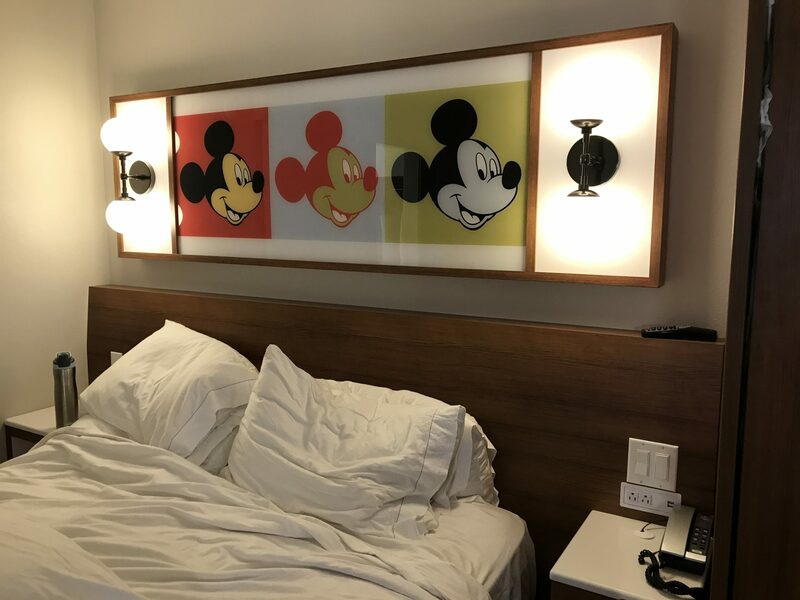 The theming of the room was consistent with the overall feel of the resort- bright colors and plenty of pictures of Mickey and the gang everywhere! 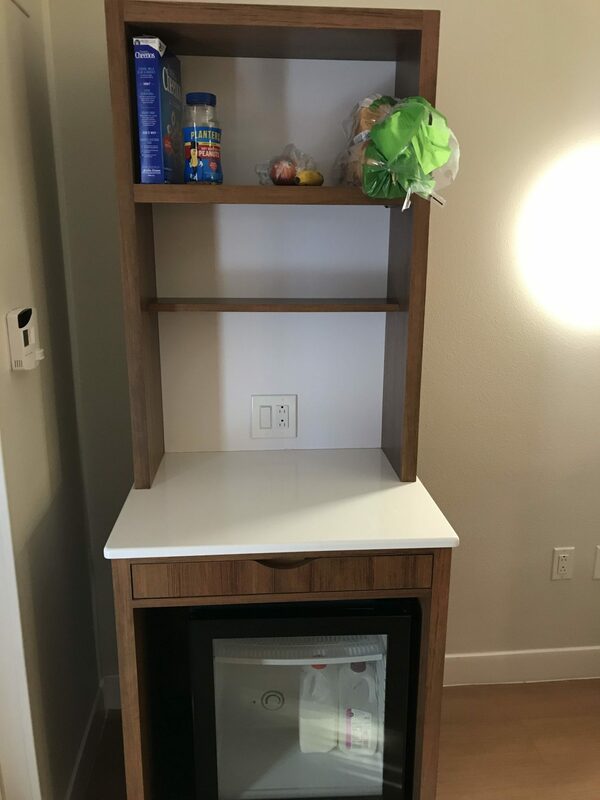 The rooms also have a nice sized “kitchen” area above the mini-fridge. There were plenty of shelves for us to keep our snacks and lunch food on. The bathrooms also had plenty of counter and shelf space for storage as well. The only complaint I have about storage space is the closet. 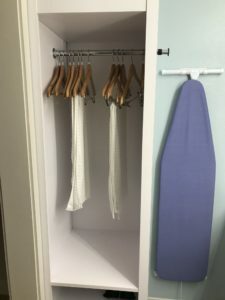 With the new updates, the amount of space you have for hangers is barely 1/3 of what it used to be. So definitely plan accordingly for that! While the closet area lacked in space, we did find it convenient that we could easily roll our suitcases under the stationary bed to get them out of the way. There was also room for small items such as shoes underneath the TV stand/dresser as well. The stand itself has 3 good sized drawers for clothes too. As far as the amenities at Pop Century, not much has changed, yet. The main building and pool areas were as I remembered from when I stayed a few years ago! The food court had a decent selection and for our group it was perfect! We ended up eating there almost every day we stayed. Now I said that not much has changed yet because Pop Century is one of the resorts that is going to be linked with the new Skyliner system that Disney is building right now! The Skyliner will connect Pop Century to other resorts and also some of the parks! The system will have Pop Century and Art of Animation on one end and then it will travel to Carribbean Beach resort. 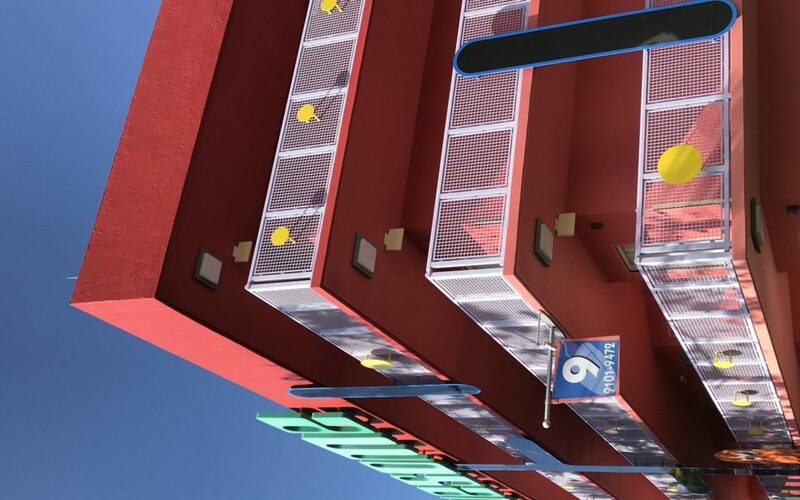 After that you can take the gondola system to Hollywood Studios, or continue on toward the new Disney Vacation Club (DVC) resort called Disney’s Riviera Resort. From there you can access Epcot as well! This new perk of staying at Pop Century will definitely keep us coming back for more! Overall we were extremely pleased with our stay at Pop Century. 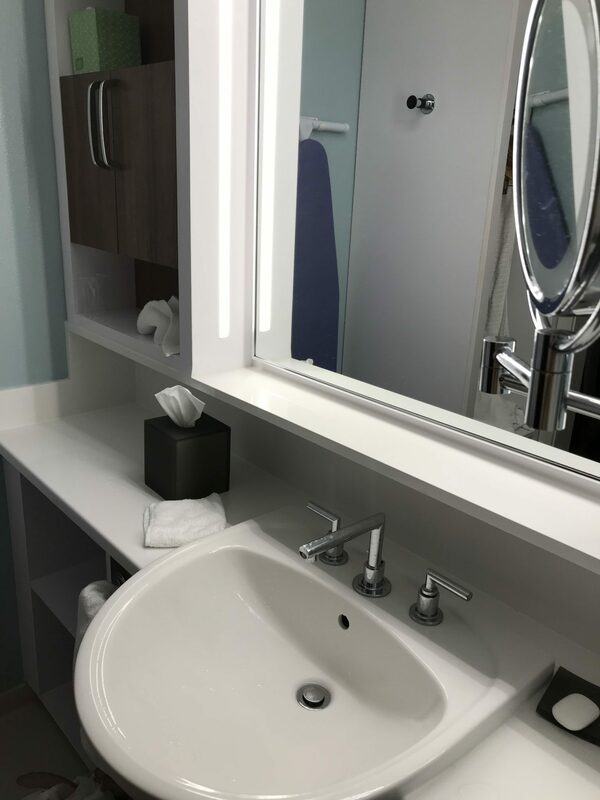 The newly refurbished rooms were a nice, clean way to spend our week on vacation! 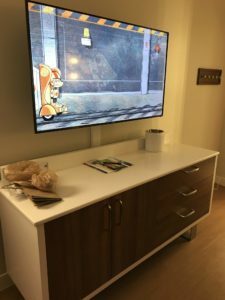 Ready to book your stay at Pop Century? Contact Patricia at All 4 Dreams Travel today! 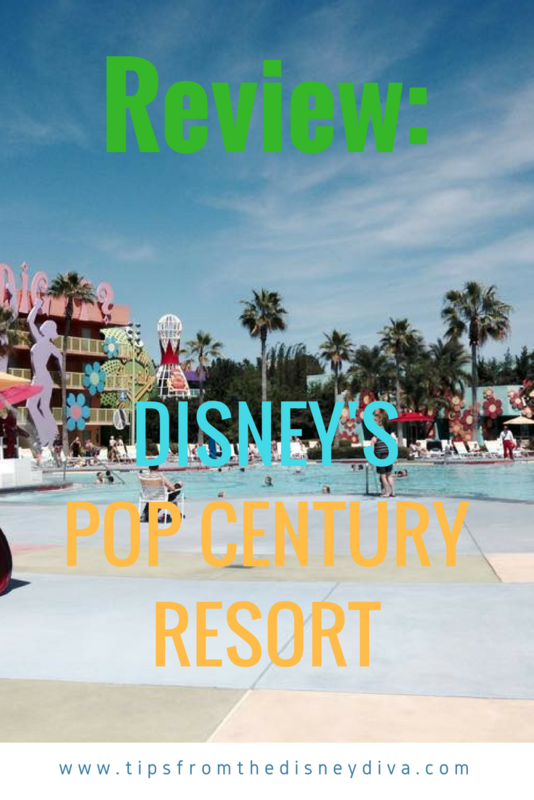 Walt Disney World: Why We Love Pop Century Resort!